Ten years ago, First Parish Church UCC, Newbury was dying physically, spiritually, and financially. Its back property was overgrown, neighbors had encroached upon church-owned land, and most congregants were either in blame mode for the dire circumstances or simply too worn down to forge a path of hope. Rev. Nancy Haverington decided it was time find God's purpose for the church. Twenty-five faithful people -- just about the whole congregation -- met weekly for a year, and prayed, researched, reflected, analyzed demographics and listened. At the end of that year, they emerged as an environmental church: "Stewards of Earth & Spirit." Not knowing what that meant, Rev. Haverington led the congregation out back for a Blessing of the Earth Ceremony. She raised a pitchfork, thrust it into the ground, and all that could be heard was a loud clank. Rock. Everywhere, nothing but rock. Despite that, one local farmer brought in bales of hay, another brought mounds of manure, and the church planted their first organic garden in two little rows of hay. The congregation disappeared for summer as usual, forgot about the garden, and came back to reap the nothingness that they had sowed. They realized they needed a new paradigm of church to manifest their vision: collaboration. They started going to Mass. Conference workshops and meetings and consulted with Conference staff. They accepted an offer from the owner of the Greater Newburyport CSA (Community Supported Agriculture), Russ Barry, to be a pick-up location for the CSA's organic vegetables and allowed the organization to use some of their property for garden space. Rev. Haverington and Missions leader Erin Stack began to partner with environmentally minded people who wouldn't disappear in the summer. Haverington joined the Greater Newburyport Leadership Institute which enabled her to network with community leaders and learn more about leadership. The church sold some church antiques to raise money, applied for grants, did some strategic planning, restructured the organization, rewrote bylaws, blogged about events, got more involved in community happenings, and transformed their website to reflect their vision and mission. 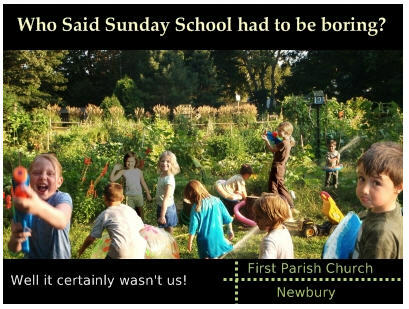 Ten years later, the church's vision has blossomed into a full mission called New Eden Collaborative which brings together community gardeners, eco artists, CSA (Community Supported Agriculture) growers and shareholders, church congregants, and local food and environmental organizations into an environment of mutual support and the common goal of creating a life-affirming, earth-friendly, sustainable community. In addition to the 41 organic community gardens that Stack manages, the church also has chickens, beehives, an earth oven, a state-of-the-art compost system, monthly garden parties, and an environmental education program. Gardeners sign a covenant of shared values, commit to volunteering a certain number of hours and donate a percentage of their cultivated produce, which the church delivers to a local soup kitchen twice a week in growing season. Many seeds have been sown by the Stewards of Earth & Spirit. Some were sprinkled over church activities, while others were planted throughout the community. But, according to Haverington, the most important component for growth has been cultivation. "Cultivation is as necessary as protecting the wild," said Haverington. "Cultivation is concerned with time, cycles, knowledge, language, discipline. We cultivate faith by regular worship and bible study; we cultivate spirituality by practicing contemplative prayer; we cultivate morality by serving." This nurturing came in many forms. A "Chapel Under the Trees" was created for outside summer worship, storytelling, and eco-services. Although at first glance it might look like a bunch of benches around a fire pit, the gathering place allows the congregants to feel rain and sun and the hush of reverential snow. "In our sacred grove, we reconnect with the wild and awaken compassion for those who do not have the good fortune of a home. Around the fire, we pray for awareness and renewal, and open ourselves to transformation by the Holy Spirit," she said. Sunday School Director, Liz Cantrell, who has both an MDiv and accreditation as an organic gardener, incorporates environmental awareness into the school program; recently, children made candles and are selling them during Advent to earn enough money to adopt rescue sheep at a new local farm animal sanctuary. Classes for adults are offered and include such topics as simple living, local eating, and food preservation techniques. The youth group hosts an environmental speaker in church once a month. In addition to these member-oriented events, the church has reached out to the community. It organizes clean-ups and offers an annual scholarship to high school seniors who demonstrate a commitment to environmental issues and whose values reflect "reverence for life." The church also hosts an annual Interfaith Blessing of the Earth Ceremony and teaches contemplative prayer through seasonal retreats. Since some studies show that children on the autism spectrum tend to have high levels of heavy metals in their bodies and are hypersensitive to sensory stimuli in the environment, the church has created an adaptive Sunday School for children with special needs. This call to expand their environmental mission by reaching out to families who have children, teens, and young adults with special needs has blossomed into a full special needs ministry. The main roots of the church's sustainability are stewardship, various grants, a concert series, and the creation of a school. The church has raised $50,000 since May which allowed for the green restoration of the church hall and transformation into their new environmental nursery and preschool called Our Secret Garden. Our Secret Garden indoor/outdoor nursery & preschool -- which officially opened this month -- teaches values through hands-on organic gardening and fosters children's sense of wonder and intellectual curiosity through nature exploration. At the ribbon-cutting ceremony, Laura Fernald, a congregant and elementary school teacher, praised the school and said it was "A very beautiful space and an amazing opportunity for our children and our community." A representative from Senator Bruce Tarr's office, Barry Pett commented: You've turned your old church basement into a solid foundation." "The blood, sweat, and tears that went into making an unhealthy, ugly, dreary place healthy, beautiful, and alive, dissipated when the ribbon was cut this month," said Haverington. "If God wants us to stay alive, we are listening, and our sleeves are rolled up for the bigger dream." The many ways the church serves as Stewards of the Earth and Stewards of the Spirit are listed on the church website and are offered to inspire others. "Our vision has blossomed into a rich and varied mission," Haverington wrote on the church website page. "We are serving God through the community by raising awareness of our responsibility as moral agents to be good stewards of the earth and of the human spirit." Rev. Haverington can be reached at the church office at 978) 465-5597 or ministernancy@aol.com.